Snake's optical camouflage breaks up when he lands onto the stage. Solid Snake (real name David) is the main character of Konami's Metal Gear series of games. He is one of the results of the "Les Enfants Terribles" project, a government project to create clones of the renowned soldier "Big Boss", and is constantly given the mission of deprogramming the various versions of the bipedal nuclear-armed tank called Metal Gear. 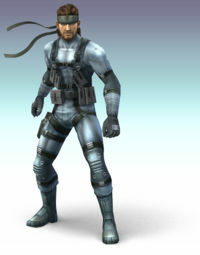 Solid Snake has appeared in the Super Smash Bros. series, debuting in Super Smash Bros. Brawl and returning in Super Smash Bros. Ultimate. According to Masahiro Sakurai, Metal Gear series creator Hideo Kojima originally asked him to include Solid Snake in Super Smash Bros. Melee, but as the game was too far into development at that point, he could not be included and was instead added into the next game. Like in the Metal Gear series at the time of release, Snake is voiced by Akio Ohtsuka in the Japanese version, and by David Hayter in the English version. Snake fights using hand-to-hand combat and uses a variety of explosives. Snake's special moves are Hand Grenade, an explosive that can be thrown various distances, Remote Controlled Missile, a guided missile that rockets wherever it is aimed, Cypher, a flying security drone that flies Snake up, and C4, a sticky explosive that can be mounted on various surfaces. Snake's appearance in Super Smash Bros. Brawl was revealed from the very first trailer premiered in May 2006. His reveal was very noteworthy, marking the first time a third-party character had debuted in the series. He uses his general appearance from Metal Gear Solid 2: Sons of Liberty, though also taking elements from Big Boss in Metal Gear Solid 3: Snake Eater, such as the facial hair and his alternate costumes based upon the camouflage suits. By doing a split-second down taunt on Shadow Moses Island, Snake contacts one of several Metal Gear characters by codec to analyze the opponent, including Mei Ling, Otacon, Colonel Roy Campbell, or Slippy Toad (though only if the character being analyzed is Falco Lombardi). His Final Smash is Grenade Launcher, in which he jumps onto a helicopter and fires grenades on the stage. Snake's Cardboard Box is first seen in a cut-scene after clearing The Research Facility, but Snake himself doesn't show until later. Once he's ready to begin his mission, Snake reveals himself to the player and begins sneaking around the Halberd Battleship. He hears a sound approaching him as he's walking around, and quickly hides in his box as Lucario and Meta Knight pass by him. However, Lucario turns back around, and sees through the box with his Aura. He picks up the box, much to Snake's surprise. Snake readies himself for battle, but Lucario notices Primids coming with his Aura. Lucario then tells Snake to follow him and they form a party. Later, they reach a room in which there are two cages with the trophies of Peach and Zelda, and the purple Shadow Bugs make dark versions of the two. The team fights the evil princesses and defeats them, rescuing the real Princesses out of the cages they are kept in. As Meta Knight and Lucario leave, Snake tells the two girls to stay where they are and then proceeds to catch up. Lucario, Meta Knight, and Snake have gone to the bridge to find that there are a lot of Mr. Game & Watches piloting the ship. Snake runs and throws them all out the window, making them all land on the deck of the Halberd and turn into Shadow Bugs. Snake and Lucario then jump out the window to see the Shadow Bugs create Duon. Later, when the team encounters Tabuu, Snake and the rest are transformed into trophies. If Snake is rescued during the Great Maze, he'll join the team and help take on Tabuu. While Snake was completely absent from Super Smash Bros. for Nintendo 3DS and Super Smash Bros. for Wii U, he returns in Super Smash Bros. Ultimate as a playable character after a decade long absence from the series. His basic moveset is mostly unchanged from Super Smash Bros. Brawl; for his down smash, however, he now executes a forward and backward kick similar to Captain Falcon instead of planting a mine in the ground. 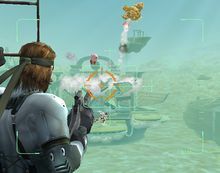 Additionally, for his Final Smash, the player controls an on-screen reticle to lock onto opponents by hovering it over them, after which Snake sends out heat-seeking missiles to attack them. Snake's series emblem is now the exclamation mark that would appear when a character is alerted in the original series, replacing the FOX Unit logo (which is also the former logo for Kojima Productions) following Kojima's departure from Konami. His home stage Shadow Moses Island also makes a reappearance, as well as his codec conversations, albeit the recycled ones from Super Smash Bros. Brawl (with the exception of the conversation on Link no longer mentioning the Clawshot) and excluding those for fighters that do not appear in that game. Snake's mobility has been significantly improved, sporting faster walking, dashing, air, and fast falling speeds, while his initial dash is also improved. Like all other characters, Snake's aerial attacks have much less landing lag, while more of his attacks have faster startup lag, and less end lag. Snake, like all other characters, can directionally air dodge, while being able to use any ground attack out of a run and any of his aerial attacks on ladders. Snake's up and down tilts, up smash's mortar shell, and up throw have their damage outputs improved; however, his standard attack, standard and down aerials, and down throw have their damage decreased. Snake is lighter than in Super Smash Bros. Brawl. Lastly, some of his attacks have had their range lowered. Hand Grenade is Snake's standard special move. 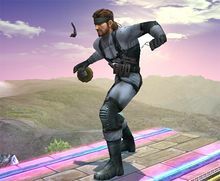 When used, Snake takes the pin off of a grenade, letting him walk around with it if the player holds the special move button. He is able to throw it at any point, and he can have up to two grenades at the same time on the stage. Three seconds after the pin is removed, the grenade blows up, even if Snake is still carrying it. Being physically hit by the grenade deals minor damage, while the actual explosion deals moderate damage and decent vertical knockback. Other characters are able to grab the grenade and throw it before it blows up. There are three types of throws: tilting back on the analog stick while throwing causes the grenade to land closer to Snake, tilting forward causes it to land farther, while not tilting causes it to land between the two. Snake is unable to hold a grenade while shielding, and he covers his ears if one blows up near him. Remote Controlled Missile is Snake's side special move. The move has Snake use a missile launcher, called a "Nikita", to fire a guided Nikita missile. The missile's path depends on which direction the control stick is tilted: not moving it lets the missile fire straight, while tilting it moves the missile in that direction, though at a much slower speed. When the missile hits something (whether it is a wall or an opponent), it explodes, dealing moderate damage to any enemies in its radius and greatly knocking them back. The missile can also be stopped prematurely by having Snake shield, which immediately stops it from moving forward and makes it plummet to the ground. It can also be damaged by other attacks, exploding if it takes too much, and its path can be altered by attacks with enough knockback. While the missile is in motion, Snake is unable to move. Cypher is Snake's up special move, based on the flying security drones seen in Metal Gear Solid 2: Sons of Liberty. Snake pulls out a Cypher unit and uses it to fly upward a certain distance. The Cypher does no damage while Snake is holding onto it, though it deals weak damage to any opponent that it comes into contact with after Snake lets go and it flies off. While Snake is flying around, weak attacks will not stop him, though they still do damage to him. Unlike all other characters, Snake's up special can be reused if he is affected by a non-damaging move that would normally disrupt the move, such as a Footstool Jump. If Snake pulls out a Cypher while another one of his is still in flight, the previous one blows up. C4 is Snake's down special move. When first used, Snake plants a C4 on the ground. Activating the move again causes Snake to pull out a remote and detonate the explosive, creating an explosion that deals strong damage to any enemies in its vicinity. If Snake is close to a wall, the C4 is stuck onto there. The C4 can also be stuck onto opponents if they're close enough while Snake plants it, and it can be passed between characters by coming into contact with them. The C4 can also be knocked off if the character that is holding it is hit with a strong attack, and eventually falls out on its own after enough time has passed. Using the move in mid-air causes the C4 to quietly drop straight down. If Snake is attacked before he pulls the trigger, the C4 does not explode. If the C4 isn't detonated after about twenty-six seconds have passed since it was planted, it blows up on its own. Snake's C4 has a one in six chance of being a butterfly-shaped C3 that is otherwise identical; this is a reference to Metal Gear Solid 3: Snake Eater, when Naked Snake molds a heart-shaped C3 into a butterfly and briefly plays self-catch with it (referring to an earlier event where he "missed" catching a butterfly due to the recent loss of his eye). Not to be confused with Grenade Launch or orange grenade launcher. Grenade Launcher is Snake's Final Smash in Super Smash Bros. Brawl. 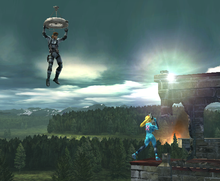 When the Smash Ball is broken open and the move is activated, Snake jumps high into the air and hangs onto a rope ladder dropped down by a helicopter, subsequently flying to the front of the screen. Snake then grabs his Grenade Launcher and starts aiming at his opponents. A reticle is placed wherever Snake is aiming, and the grenades that he fires land straight on it. Each grenade explodes on impact, dealing great damage to anything in its radius. After six shots are fired, Snake reloads the clip of the launcher. Firing six more clips ends the Final Smash, dropping Snake off back on the stage. Snake fires automatically if too much time is spent between grenades. The Final Smash also ends after a long period of time, even if not all of the grenades have been fired. Covering Fire is Snake's Final Smash in Super Smash Bros. Ultimate. 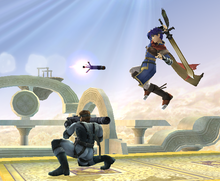 When the Final Smash is activated, Snake will toss a flare grenade before crouching and putting his hand up to his ear, which will cause a crosshair to appear onscreen. This crosshair can be guided by the player and will lock onto other fighters. After a brief moment, rockets will launch from the foreground and attack the targeted fighters, dealing damage and launching them. 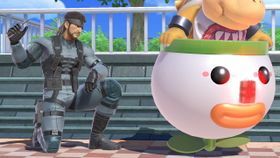 If the move is activated while Snake is in the air, he will stay in place for the duration of the Final Smash. Snake: Colonel, it's me! I'm fighting myself! Colonel: Snake, what's going on out there?! Could it be...? Has the "Les Enfants Terribles" project really come this far?! Snake: It's more than that. He's got my moves, my gear... It's like looking in a mirror. Colonel: Do you think they collected data on you and created another Snake...? Snake: He's got the same build, too. Creepy. But his Sneaking Suit is a different color. And his tactics are slightly different. Colonel: Interesting. So even if you're evenly matched in power, your fighting styles will make a big difference. You've faced tougher odds in the past, Snake. Don't let this impostor beat you!! Metal Gear Solid A former member of FOXHOUND with an IQ of 180 and mastery of six languages. He's an infiltration specialist whose ability to carry out missions under any conditions has made him a legend. He's saved the world three times from the threat of bipedal, nuclear-armed mechs called Metal Gear. Currently he's working with the anti-Metal Gear group known as Philanthropy. Wii Super Smash Bros. Brawl Snake's Final Smash. He grabs a ladder hanging from a helicopter and appears in the foreground, then fires a grenade launcher at foes. The grenades explode on impact and damage anyone in the vicinity. Each clip holds six grenades--empty one, and Snake reloads. He can fire a total of twelve shots, but with such limited time, it's better to shoot 'em all. Metal Gear Solid 2: Sons of Liberty A SEAL member who infiltrates the Big Shell to suppress a terrorist group threatening to destroy it. He joins forces with Raiden, a new recruit in the special-forces unit called FOXHOUND. Disguised in order to secretly infiltrate the Big Shell, Pliskin is actually Solid Snake. Metal Gear Solid 2: Sons of Liberty An unmanned aerial surveillance vehicle used by the U.S. Army. It uses a fan in the center of its body to hover and a camera on its upper fuselage to monitor from the skies. It has a number of models, including the armed Gun Cypher and the remodeled Cypher II. Its small size and continuous flight ability make it extremely effective in guarding against intruders. Palutena: The Legendary Mercenary himself. Pit: I never thought I'd get a chance to fight him again! Palutena: Snake is fully loaded with explosives and firearms. Don't get blown up. Pit: I bet if I put some bombs on the end of my arrows, they'd be more powerful. Palutena: You can't attach bombs to Arrows of Light since they aren't actual arrows. Pit: OK, then let's bust out the cannons! Viridi: Leave the bombs and guns to Snake. You focus on what you do best. Whatever that is. In the codec call about Yoshi, Snake suggests capturing him to "see what he tastes like," Naked Snake's typical response to animal life in Metal Gear Solid 3. Ironically, Yoshi would later make a cameo in the Nintendo 3DS game Metal Gear Solid: Snake Eater 3D as a replacement for the Kerotans, and even having a radio call about Yoshi added in. A Yoshi doll and a Mario doll also got a cameo in The Twin Snakes, predating Super Smash Bros. Brawl. Shooting the Yoshi doll will have Yoshi use its cry pre-Yoshi's Story and shooting the Mario doll will have the 1UP sound-effect playing and restore Snake's health slightly. In the codec call about Peach, Snake, after criticizing Peach for constantly letting herself get kidnapped instead of actually doing something to prevent it, is accused by Mei Ling of not getting many dates, alluding to how he constantly has trouble maintaining a constant relationship with various women, notably stiffing Holly White in the ending to Metal Gear 2: Solid Snake and his leaving Meryl Silverburgh sometime between Metal Gear Solid and Metal Gear Solid 2: Sons of Liberty. In the codec call about Donkey Kong, Snake refers to the latter as being a "chip off the old block" upon learning about how he's the most recent Donkey Kong after inheriting the title from Cranky Kong as well as continuing the tradition of being a rival to Mario, alluding to how Snake himself inherited his title from his "father", Big Boss/Naked Snake, who himself had inherited the title of "Boss" from his mentor and mother figure, The Boss. When Snake talks about Sonic the Hedgehog over his codec, he mentions that he dislikes Sonic, giving no specific reason as to why. This may be a reference to hedgehogs being common snake predators in real life, as their spikes prevent the snake from being able to eat it. In the Japanese version of the game however, the codec call can be assumed as a joke, because Snake's Japanese voice actor, Akio Ōtsuka, is the son of Dr. Eggman's Japanese voice actor, Chikao Ōtsuka. 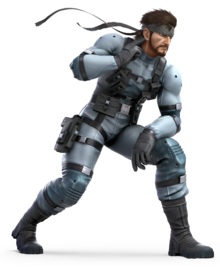 Solid Snake is one of only three characters in the Super Smash Bros. series to come from an M-rated series, with the other character being Bayonetta from Super Smash Bros. for Nintendo 3DS / Wii U and returning to Super Smash Bros. Ultimate, and Joker from Super Smash Bros. Ultimate. Snake, or more specifically, his frequent usage of the cardboard box, is referenced in Paper Mario: Color Splash: when in Fort Cobalt, a Toad is hiding in a box, saying he's being "stealthy." Although he is called "Solid Snake" in this game, his actual appearance is technically a mixture between Solid Snake himself as well as his "father", Big Boss, or more accurately his Naked Snake self from Snake Eater. ↑ [E3] Interview: Super Smash Bros. Brawl, Miyamoto, Sakurai. N-Sider (May 11, 2006). Retrieved January 1, 2016. This page was last edited on March 19, 2019, at 07:45.